Don’t let physical limitations stop you from enjoying the outdoors on a bike! Are you wishing you could be riding a bike again? 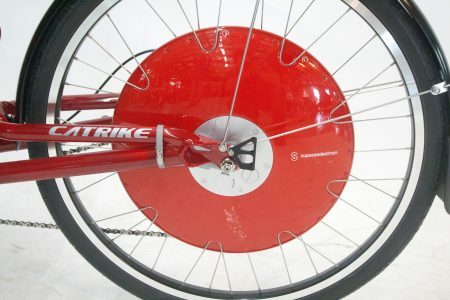 A recumbent bike or trike just may be what the doctor ordered! 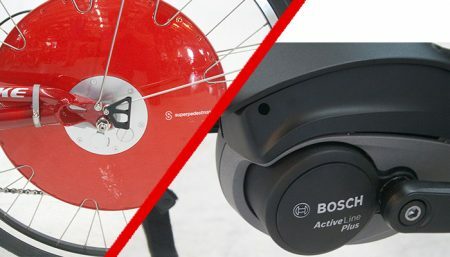 We stock many bike and trike designs that are far more adaptable and accessible than the typical upright two-wheeled bicycle concept. Maybe a new recumbent bike or trike would bring back your freedom to ride. 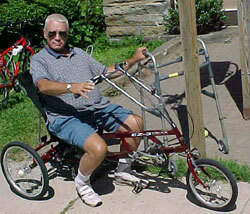 Over the years we have adapted / fitted recumbent trikes for riders who use a walker or forearm crutches. Riders who have lost the use of one arm or who need help transferring from a wheelchair into their trike. Exercise is important if you are in peak health and even more important if your health peaked quite a while ago. Some of our customers are recovering from multiple hip and knee replacements, spinal fusions, traumatic brain injury, amputation, car or motorcycle accidents heart attacks or stroke. We have customers who successfully ride in spite of nerve disorders, balance ailments, MS, ALS and Parkinson’s. Some were serious bike racers, fitness buffs and commuters. Others are reformed couch potatoes, dieters and even folks just out of cardiac & post-operative rehab. 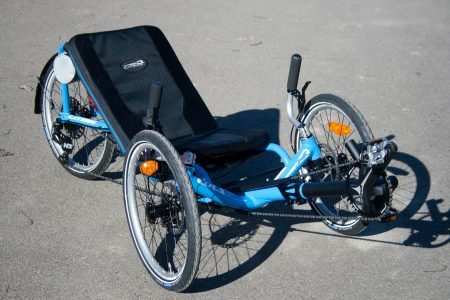 A recumbent bike – trike is working for them; it may well work for you. 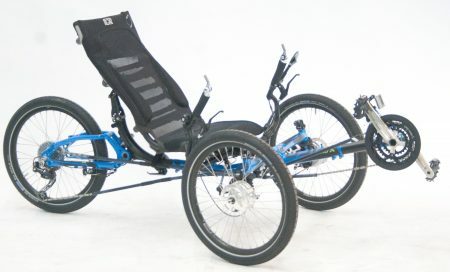 We have fitted recumbents for riders from age 9 to 90. 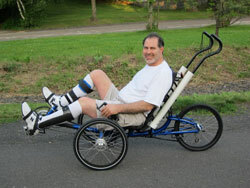 Recumbents are a very versatile, adaptable & adaptive means of comfortable exercise, rehab and transportation. Adaptive pedals and cane holders let Gary ride again! Personally I find working with these customers extremely rewarding. You may call them differently able, handicapped or physically challenged, I call them overcomers. When life gave them every excuse to sit down and feel sorry for themselves they refuse to be counted out of the game. They don’t expect riding to be as easy for them as it is for their friends and neighbors, but what is anymore? My hat is off to them! Now how can I help you! When the weather prevents you from riding in the great outdoors it is important to know there are still options for your health & fitness needs. Like traditional bikes, recumbent bikes and trikes can be used indoors on an exercise stand or rollers. This can provide a comfortable way for you to keep up your exercise and stay in shape all year. Whether you are graduating from cardiac rehab or a disabled Vet don’t let the weather or your circumstances prevent you from being an overcomer in the comfort of your own home. Test riding is the best way to see what type of bike/trike works for you and which model you enjoy most. Spend a few days if you like. Try them in a parking lot, on back roads and up hills till you know what you want. If you just can’t come try them we can work with you by phone and email then ship one to you. in stock and ready to test ride.